Souvenir Building collector Steve V. sent me photos of an amazing replica he got a few years ago in NYC. Made of cast iron, its a miniature version of an entire factory. The replica includes all the water towers, smokestacks and even two full trains and rail lines. Originally, it was mounted on a tall oak box with a brass maker plate. Measuring 39 inches across, it has a green painted finish. Steve was told the real Regal Shoe factory had this on display in the lobby. "I thought at first it was damage 'till I saw a picture of it. There is a hole in the back bottom and if a lightbulb is put under it the light shines up into all the buildings and there are many "open" windows so the light shines out," Steve wrote. The entire Regal replica consists of 9 buildings, 4 rail systems, 3 smokestacks and 3 water towers. The real Regal Shoe Factory was in Whitman, Massachusetts. The town of Whitman has a rich history that is rooted in the shoemaking industry. Regal Shoe and Bostonian Shoe are the most notable. 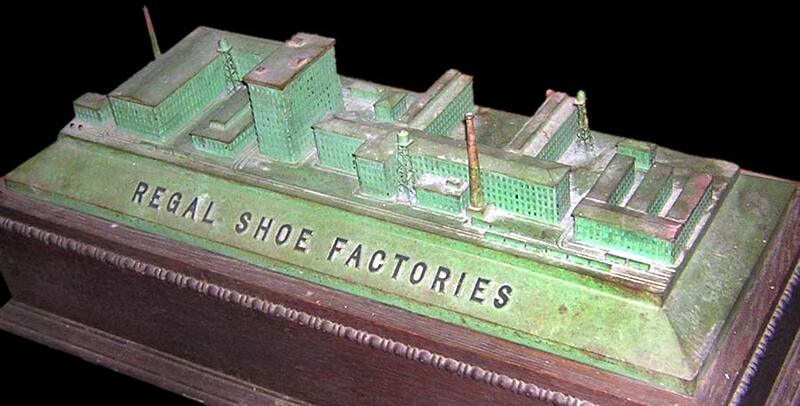 At one time there were over 20 shoe factories and related factories making metal shanks in town. There are a few abandoned factories left, and some have been turned into condominiums.